"His Majesty's ship Acasta, 27th of March, 1815.
" JOHN TREVARTON , Purser." "The Commissioners for Victualling his Majesty's Navy, London." With intention to defraud our Sovereign Lord the King, against the statute. SECOND COUNT. For feloniously uttering and publishing as true a like forged bill of exchange, with the like intent. THIRD & FOURTH COUNTS. The same as the two former, only stating the prisoner's intent to be to defraud John Clark Searle , esq. George Philip Towry , esq. Nicholas Brown , esq. Thomas Welch , esq. John Aubin , esq. Frederick Edgecumbe . esq. and Robert William Hay , esq. Commissioners for victualling his Majesty's Navy . FIFTH & SIXTH COUNTS. The same, only stating the prisoner's intent to be to defraud Alexander Robert Kerr . SEVENTH & EIGHTH COUNTS. The same, only stating the prisoner's intent to be to defraud John Trevaston . "G. Guy" with intention to defraud our Lord the King. TENTH COUNT. That he having in his custody and possession a like bill of exchange, upon which was a like forged indorsement thereof, feloniously did utter and publish as true the said forged indorsement of the said bill of exchange, with the like intention, he knowing it to forged, against the statute. ELEVENTH & TWELVETH COUNTS. The same as the ninth and tenth, only with intent to defraud the persons named in the third and fourth counts, viz. The Commissioners for Victualling his Majesty's Navy. THIRTEENTH & FOURTEENTH COUNTS. Only with intenth to defraud Alexander Robert Kerr. FIFTEENTH & SIXTEENTH COUNTS. The same, only with intent to defraud John Trevaston . "5th of June, V. O." I believe that to be Mr. Evitson's writing. - No; I am corrected; it is not so. "5th of June, V. O. 1147." V. O. means Victualling Office; the last means that it is registered on the 5th of June, and that the number of the entry is 1147. JOHN EVITSON . I am a clerk in the Victualling Office. I look at the forged bill, and see my initials on it. I wrote them for the purpose of signifying that I checked it off; I mean by that, that I had heard the case read off against the bill. "on the 13th of June, to George Williams, for George Guy , 7, Montague-street, Russell-square." That entry refers to the bill No. 1147, registered 5th of June, the amount eight hundred and sixty eight pounds nine shillings and sixpence. (Forged bill put into the hand of the witness.) I think that is the bill. By the entry in my book, I am enabled to say, that I delivered the bill to a person named George Williams , for Mr. Guy; that is, that the person who came for the bill called himself Williams, and said he came from Mr. Guy. RICHARD BOWER. I am a clerk in the Victualling Office. It is my business to deliver out what is termed the case. LORD ELLENBOROUGH. Then the case is a proecipe to the cashier, for the payment of the bill. "eight hundred and sixty-eight pounds nine shillings and sixpence, bill delivered on the 5th of July, to George Williams, for George Guy , 7, Montague-place, Russell-square." The latter part of the entry enables me to say that the person who called for the bill, called himself George Williams , and said he came from George Guy . (Forged bill and case thereof, put into the hands of the witness.) There are the bill and case to which my entry relates; I annexed the bill to the case, and delivered them to Williams. CHARLES TWEDIE . I am cashier of the Victualling Office. (Bill and case thereof, put into the hands of the witness.) That bill and its case were delivered to me for payment. on the 5th of July last; I recollect that it was past two o'clock considerable; that was after the hour of business, which closes at two. I recollect a reason for my giving a draft; the person who brought the bill said it would be a matter of consequence, as he came a considerable distance. I accordingly paid him with this draft upon the Bank of England. (Producing the draft.) The name of " George Williams ," is on the back of the bill; that is the name of the person who brought the bill, and by whom, by that means it was discharged. Mr. Attorney General. Then John Nokes brings his bill to you, and you having given him a draft upon the Bank of England for the amount, he puts his name upon the back of it, and by that means discharges it - A. Exactly so. A. I did not see it then. A. I know nothing at all about it. GEORGE JAMES WILLIAMS . I am in the employ of the East India Company, as a rider in the home department. I have been acquainted with the prisoner for the last three years. He called at my father's house, and requested I would call at Somerset House to do a little business for him; he told me to come between twelve and two. I went. He gave me a particular bill, and told me to go to a certain apartment for a bill; he pointed out the particular apartment to which I was to go; he gave me some instructions; he told me to say I came from Mr. George Guy , Montague place, Russel square. He assigned as a reason for his not doing this, that he, being a clerk in Somerset House, was not allowed to do agency business. He said, the bill had been sent to him by a friend, a lieuteuant, in the Country. He shewed me a part of a letter, which had an import to that effect. So instructed, I went to the place which he directed me; I was asked the questions which he pre-supposed to me that I should be asked, and I gave the directed answers. I got the bill; I gave my name in, George Williams , for George Guy ; the bill then purported to be accepted. (Forged bill put into the hands of the witness.) That is the bill; my signature is affixed to it, which I did when Mr. Twedie gave me the draft upon the Bank of England for the payment of the amount. When I so received the bill, I gave it to Bradford; he, and I, then walked into the City together; then we parted. He called upon me, on the 5th of July, at my father's house, and requested I would call upon him that day at Somerset House, before two o'clock. I went accordingly to his request. He then gave me that bill, and directed me to go into a certain apartment for a case. I did not then know what the case meant. He pointed out the appartment. I went, and gave in the bill, and got it back affixed to the case; the bill was wafered to the case. (Case put into the hands of the witness.) That is the case to which the bill was wafered when delivered to me. I was then directed by the gentleman from whom I got it, to go to Mr. Twedie, but I went to the prisoner, who accompanied me to the outside of the door of Mr. Twedie's office, and as it was past two o'clock, directed me, if Mr. Twedie should object to pay the bill on account of its being past the hour of business, to say, he would oblige me by paying it at that time, as I came a considerable distance. I then went to Mr. Twedie; he made the objection, on account of its being past two o'clock; I made the directed reply, and received the draft from Mr. Twedie to prevent my having the trouble of calling again. On my coming out, Bradford was in the hall, and I gave him the check. - A. "Received for George Guy, 7, Montague place, Russel square. George Williams." When I delivered that draft to the prisoner, no such writing as that was upon it. There is no part of that my hand writing. We then went to the Bank together; I saw him write something upon a piece of paper, which I supposed was the description of the notes he wished the check to be paid in; I remember he received a five hundred pound note, for I heard the clerk say what notes he wanted. After he was paid, we walked together as far as the end of Leadenhall-street, and there we parted. I never have received any gratuity or recompence in any way whatever for this business which I transacted for the prisoner. Cross examined by Mr. Alley. I am positive I received the bill in Somerset House, and not in the City. I believe this bill to be the same I left for acceptance; it was out of my possession for a considerable time, from the middle of June to the 5th of July; but under all circumstances, I believe it to be the same. Be-examined by Mr. Attorney General. When I delivered the bill to the prisoner after I received it again, he did not make any objection that it was not the same bill. PETER BENTLEY. I am a clerk in the Bank of England. (Check put into the hands of the witness.) On the 5th of July last, that check was entered for payment; I look at the back of it, and by that means am enabled to say that it was presented on the 5th of July; on its being presented, I requested the person who presented it, to write a receipt on the back of it, as is customary; that person did so, and I gave him an order, a voucher on the cashier for payment. I hold in my hand the order I gave the presenter for eight hundred and sixty-eight pounds, and a separate order for nine shillings and sixpence. THOMAS WRAGG . I am pay clerk to the Bank. On the 5th of July, an order was sent to me by the last witness, for payment of eight hundred and sixty-eight pounds; the bank notes in which I paid it were checked by Mr. Bonquet. JAMES JOHN BONQUET . I checked the notes which were paid by the last witness, in satisfaction for that draft; among others, I paid a five hundred pound note, dated the 20th of June, 1815, and numbered 5327; also a twenty pound note, dated 26th of May, 1815, number 3747, and also a ten-pound note, dated 7th of June, 1815, number, 12,553; I also paid two hundred pound notes; I paid to the amount of eight hundred and sixty-eight pounds. MARY HEDGES. My husband keeps a public-house, called the Nelson, in Nelson-street, Hackney road. "at Mr. Sharp," that being the place where the prisoner lodged. A. It is, I believe. JOHN VAUGHAN . I am a journeyman to Mr. Fielding, pawnbroker, of Whitechapel. I recollect a person coming to our house, on the 5th of July, in the present year, to redeem a silver watch, which had been pledged; the principal and interest of which amounted to one pound nine shillings and seven pence; he tendered in payment this note, (producing a note,) which I changed, deducting the amount, and delivering him the watch, together with the change; he put on the front of the note, Mr. Smith, 7, Oxford street, Whitechapel, and that was the name in which the watch was pledged; (turning to a book.) The number of the watch was 2698, and the name of the watch maker was James Rollinson , London. Cross examined by Mr. Alley. A. On the day the watch was pledged. Mr. Alley. Then my lord, I submit that this will not do. Mr. Attorney General. The reason it is called a duplicate, is this; two tickets are made out, one is affixed to the article pledged, the other, which is a facsimile of it, is delivered to the pawner, who upon wishing to redeem the pledge, presents you that ticket; you then have recourse to the pledge; on your observing a correspondence, between the ticket given you and the duplicate on the back of the pledge, you know it to be the same, and deliver it to the pawner, on the payment of the principal and interest - A. Exactly so. LORD ELLENBOROUGH . That will do. A. A ten pound note, number 12,555, 7th of June, 1815. "No. 5327, dated 20th of June, 1815." The watch was produced to me by Mr. Sharp; I had my reasons for asking for it.
" John Trevaston ," is not his hand writing. JOHN TREVASTON . I am purser of his Majesty's ship Acasta; that vessel was at Say on the 27th of March. This signature affixed to the bill in question, "A. R. Kerr," is not his hand writing. JOHN ROSS . I was acting lieutenant of his Majesty's ship Acasta. I have examined the signatures "John Trevarton and A. R. Kerr," affixed to this bill. I am well acquainted with Captain Kerr's and Mr. Trevarton's hand writings, and neither the one nor the other of these signatures is either of their hand writings. ________ TULLY. I have had various opportunities of observing Captain Kerr and Mr. Trevarton write their signatures. Neither of these names written on this bill is either of their hand writings. MARY SHARP . The officer, Vickery. came to my apartments for a watch; it was Mr. Bradford's watch; he used not constantly to wear it about his person. I saw the officer search the drawer under the bedstead Mr. Bradford occupied the apartment where that drawer was, in which the note was found. Mr. Bradford slept in that room the night previous, and went out at the usual hour in the morning. "received. 5th of July, George Williams, for George Guy ," are the prisoner's hand writing. "hers," and therefore that statement was not maintained. LORD ELLENBOROUGH. This has been the case by the application of a wafer, and I don't think it is a defect at all. I am endeavouring to find a word of which this can be a fragment consistent with the context, and there is no other word than "vouchers." Without that, it would be rank nonsense. Prisoner's Defence. I received the bill from Guy. Eight respectable witnesses gave the prisoner a good, character for integrity and assiduity in his official duties for five years previous. GUILTY - DEATH , aged 23. First Middlesex Jury, before Lord Ellenborough. 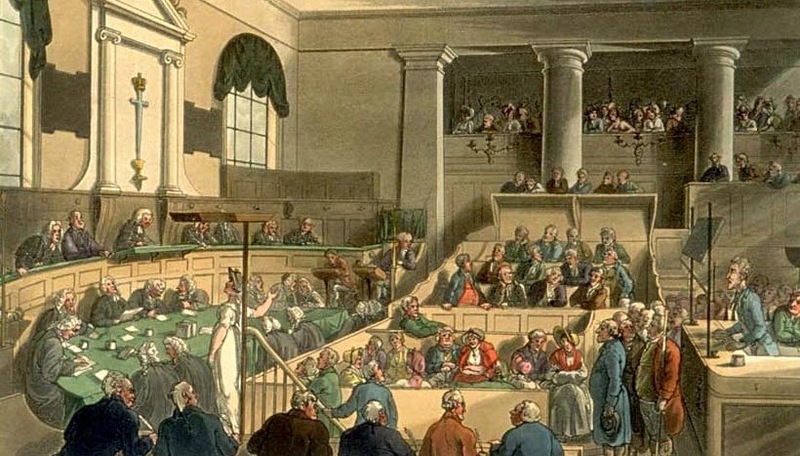 October 1815, trial of WILLIAM BRADFORD (t18151025-116). That's a fascinating look into how bills of exchange were processed and paid! I note that George James Williams, an employee of the Honourable East India Company, would be a writer not a rider - I must presume this is a clerk's error in the original document rather than a transcription error. The HEIC used the term writer to mean a clerk, which is what Mr. Williams would seem to be by the information given in his testimony.